After a few months’ hiatus, this post continues our series of reports from our far-flung PhD alums, who we asked to get us caught up on what they’ve been doing and reflect on their lives as historians. Ann Ostendorf earned her PhD from Marquette in 2009 and has taught at Gonzaga University in Spokane ever since. She is currently an associate professor, and author of Sounds American: National Identity and the Music Cultures of the Lower Mississippi River Valley, 1800-1860 (Athens: University of Georgia Press, 2011). “Life changes after tenure.” At least that is what the AVP told me when she called at 7:45pm on Tuesday, May 19th while I was eating soyrizo taco s with homemade guacamole. Not that I was worried. I had already been promoted to Associate Professor last spring, so tenure should be pretty cut and dry, right? I can’t remember anything else she said to me during that phone call except that “life changes after tenure.” What was going to change? I’ve been pondering this ever since. While cleaning my house (top to bottom, drawers and closets), as I’ve intensified my yoga practice, as I’ve gardened various plots all over town. While going for hikes, while visiting family, while having lunch with all those people I always just wanted to have time to talk to. What could she mean? What would change? I asked my non-tenured friends what they thought she could mean. “Less service work?” one suggested. I thought it must be something more—something deeper, more profound. It seems I’ve got some free time to figure this out. I’ll be on sabbatical all next year. I’ve got research projects I plan on completing and others I plan on starting. I’ve got projects for the school I’ll continue to move forward with. Sure, I won’t be teaching, but this other stuff will keep me plenty occupied, right? What’s going to change? I’d love to hear from you if you know. I want to be ready for the big change—wouldn’t want to miss it! 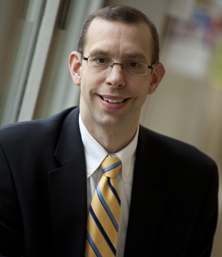 Daryl Webb received his PhD from Marquette in 2007; his dissertation was on “Milwaukee Children in the Great Depression.” He is an assistant professor at Cardinal Stritch University in Milwaukee. I have found teaching history at a small liberal arts college both challenging and very rewarding. The biggest challenge is the balancing all of the many responsibilities. Working at a teaching centered institution it is hard to find the right balance between research and teaching. While I am required to be a strong teacher, I also must produce scholarship. It is a difficult to find the time to create strong classes and publishable scholarship. The other challenge in teaching a small liberal arts college is all the topic you must master or more accurately stated fake mastery over. In my eight years teaching in the my small department, I have taught twenty different courses on a wide ranging topics from children’s history and colonial history to course on the Twentieth Century America, history of American religion and Asian civ. Despite these challenges, I still take great joy in teaching and working with students. There is tremendous reward in teaching a great class, helping students understand and enjoy the past, and watching young people grow intellectually. It is truly a great gig. Kathy Callahan received her PhD from Marquette in 2006. She is associate professor and chair of the history department at Murray State University in Kentucky. Her primary research interest is women in early modern (1500-1815) England and Scotland. She has published articles in the Journal for the Study of British Cultures, The Journal of Social History, and The London Journal on women and crime in late eighteenth-century London. She is currently researching the life and activities of Anna Scott, Duchess of Buccleuch of Scotland. Life has been busy since I left Marquette. I’ve had two tenure-track jobs, made two moves, and researched, taught, and traveled extensively in Europe and visited China twice, as well. I now teach at Murray State University in Murray, Kentucky. I’m the British historian and also teach world history nearly every semester. The students here are fabulous which makes teaching so enjoyable. They are friendly, engaging, and, f or the most part, eager to learn. We have several graduates who pursue graduate degrees. In fact, one will be at Marquette in fall 2015! I was recently named Department Chair, so I am slowly shifting into new responsibilities. Wow! The new position challenges me in new ways every day. Dr. Marten, how have you done the job so long? I began my teaching career at UWM; once I finished my PhD I took a tenure-track position at UW-Stout in 2006. UW-Stout didn’t have a history program so I wasn’t teaching British history, nor did they have a graduate program. My move to Murray State in 2009 gave me the chance to do all three: work with majors, teach British history, and work with students in our masters degree program. One of the other things I have been involved extensively at Murray State is education abroad. My interest in this started because of my two fellowships I received while at Marquette: the Smith Family Fellowship and the Raynor Fellowship, both which afforded me the opportunity to live in London as I conducted research for my dissertation. Living in London provided me with not only research opportunities, but important cultural opportunities as well. Not long after I finished my PhD, I received a Fulbright-Hayes Fellowship that took me to China for a month. I’ve taken students to Scotland, taught for two semesters there, and have traveled to London for a spring break education abroad program focused on London as an imperial city. My current research is on a Scottish Duchess, so those trips to Scotland have paid off! Recently, I traveled with three MSU faculty members to Qingdao, China where I helped them build their own study abroad programs at our partner school, Qingdao Agricultural University. I’ll spend part of the fall semester with our program in Regensburg, Germany. Education abroad provides students with experiential learning activities that cannot be obtained in the traditional classroom. In the big scheme of things, my career has been much like I thought it would be. Since I had a ten-year career in higher ed. as an administrator before I began grad school, I had a good idea of what to expect. The most challenging thing for me was my tenure process. I had to produce two additional articles in three years at MSU. I made it, but it wasn’t easy; thank goodness for my dissertation! Balancing teaching and research was easier because of my experience as a teaching assistant at Marquette. I don’t have a book yet, but I am particularly proud of my article published in the Journal of Social History. Certainly, the profession has challenges. Heralding the humanities remains high on my priority list as department chair. As the emphasis on STEM education continues, we must work with our students to help them articulate what they’ve learned as history majors and how their skills can be transferring to a countless number of careers. Our department will be focusing on the development of more experiential learning opportunities for our students as a way to help them better understand their skills and talents in preparation for their futures.